So here is the deal. Chocolate cookies are amazing by themselves. And so is cream cheese frosting. 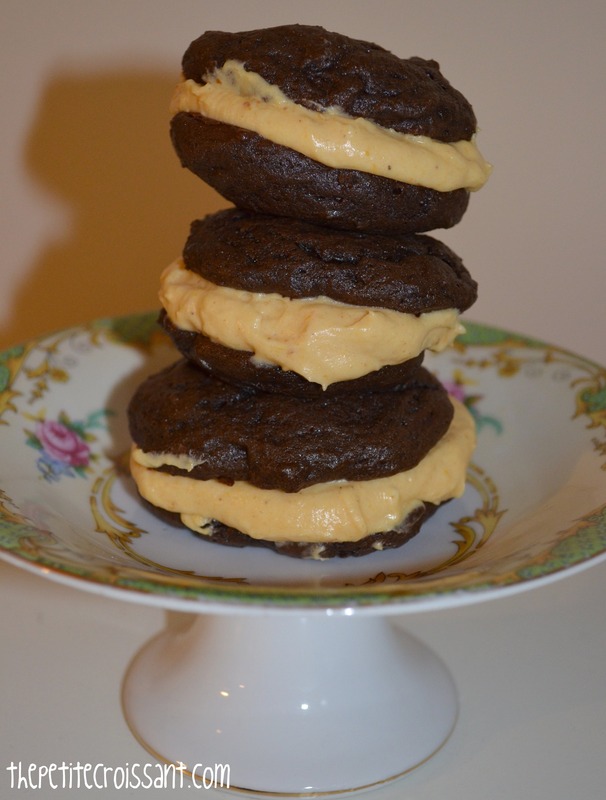 So why not put the two together and end with a delicious whoopie pie sandwich? 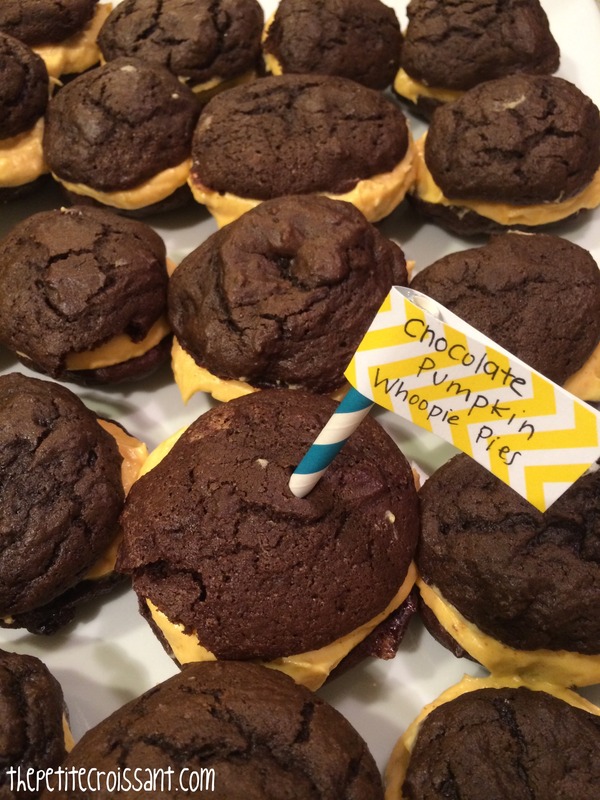 I made these around Thanksgiving time so I did pumpkin cream cheese frosting, but you could substitute that in for a plain cream cheese frosting, or you could also make mint frosting to go with the chocolate. It’s well established that I love muffins. But sometimes, I want to be healthy and just can’t eat a big hearty muffin every morning. 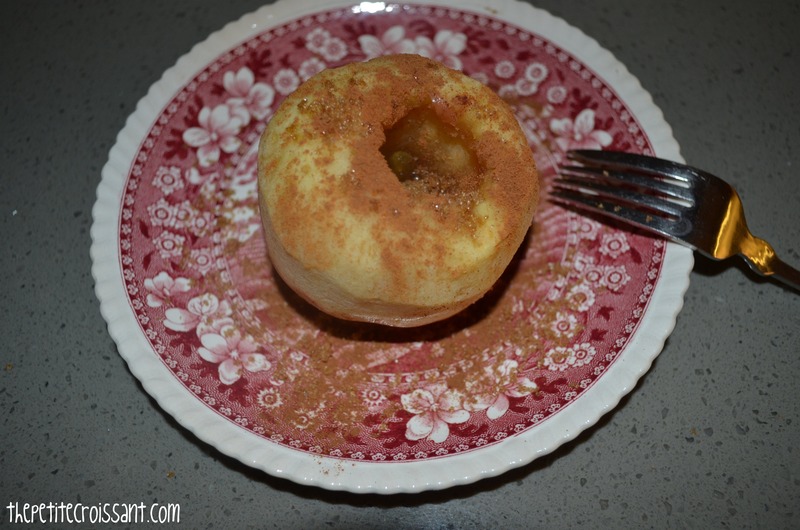 So I found a compromise – a muffin that’s filled with lots of healthy stuff and isn’t quite so sinful. See below. Also, just a note, the blog will be quiet for the next two weeks because I will be attempting to survive my first set of law school finals. But I promise to be back on Wednesday, December 18, after all this craziness is over. Wish me luck! I used to not like onions. I know what you’re thinking, who was I? And I totally agree. Who doesn’t like onions? First of all, they’re on everything. Second of all, they’re so delicious!! The first time I consciously had caramelized onions (and also watched someone make them) was back when Dave and I first started dating, and it was actually an important day in our relationship. Perhaps this is where my new love for onions comes from! There are so many great things you can do with them, but often they are an add-on to a dish, and not the dish themselves. So when I saw this tart, I just had to try it. And oh my god, it is amazing. 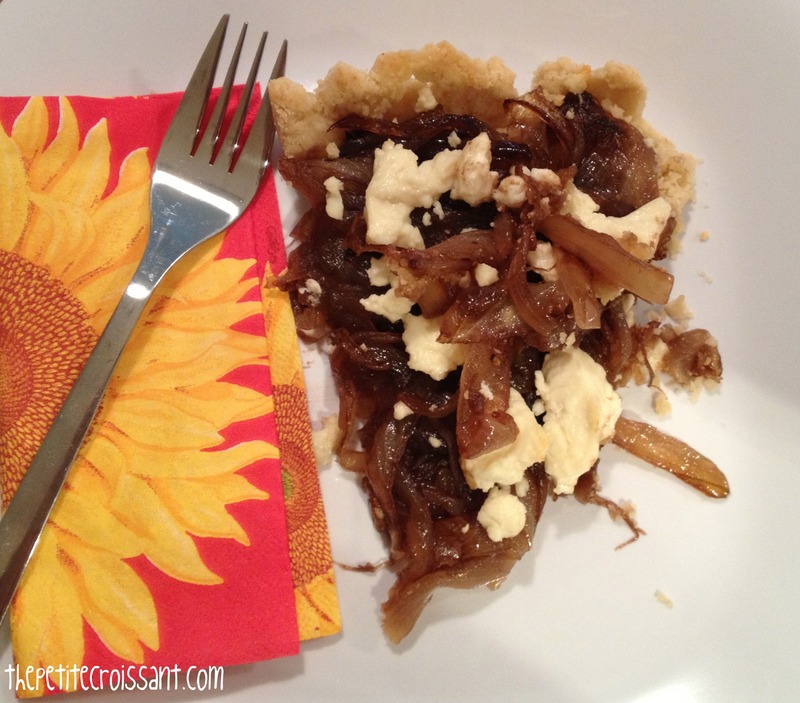 The combination of balsamic vinegar and onions is a truly good partnership. This dish is the perfect appetizer because it’s surprisingly light! It’s also a great dish to make while making other things, because while you don’t actually have to do a ton of work, the onions do have to sit on the stove for an hour to an hour and half. So it’s perfect to do while you’re preparing something else. In the fall, I always try to have pumpkin around. I like to throw it in everything- risotto, croissants, and pasta. 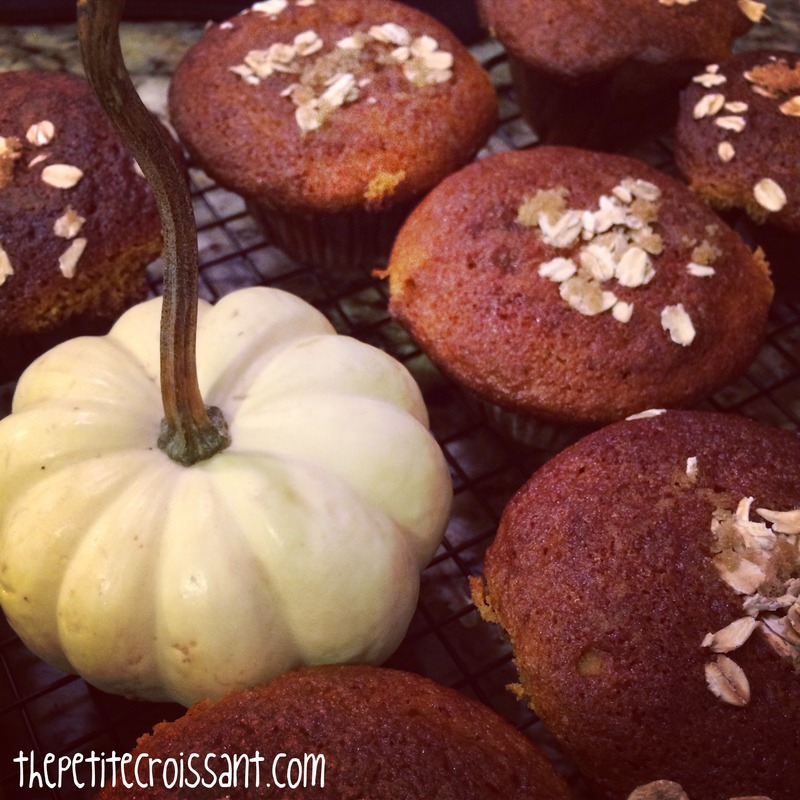 This weekend I had some extra pumpkin, and I love whipping up random baked goods on Sunday mornings, so I decided to go looking online for something breakfast related with pumpkin. 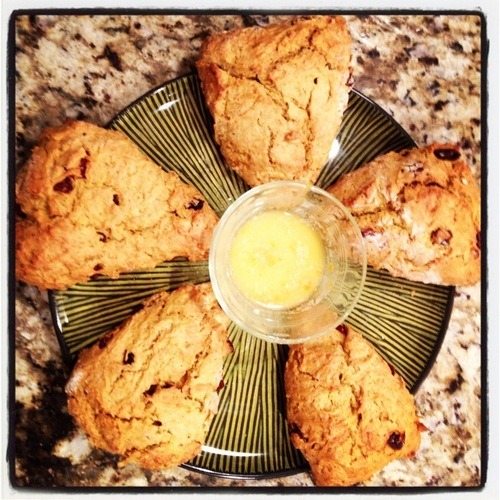 The result was cranberry pumpkin scones. I was introduced to a farm out in Maryland a few years back where you can pick your own fruit and vegetables, and ever since then I have been making the trip up there regularly. In the spring and summer, it’s to pick boxes and boxes of my own berries and peaches. In the fall, it’s to stock up on apples, pumpkins, gourds, and other amazing fall vegetables. We made our annual October trip up there recently and spent way too much money on apples. Now that I have all of these apples, I have been trying to get creative with how to use them. 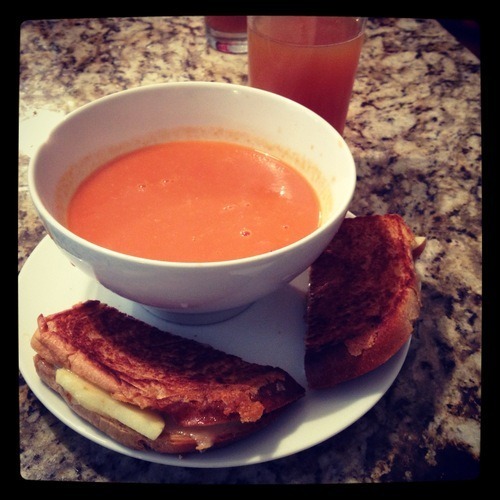 On a recent perfect fall Saturday, I decided to use them in one of my all time favorite, all-American meals—tomato soup with grilled cheese. It was perfect on a day when it was just a bit chilly outside, but not so cold that you had to be stuck inside. I used the creamy tomato soup from Trader Joe’s and then for the grilled cheese, I did white cheddar with sliced fuji apple on whole wheat bread. Oh my god. 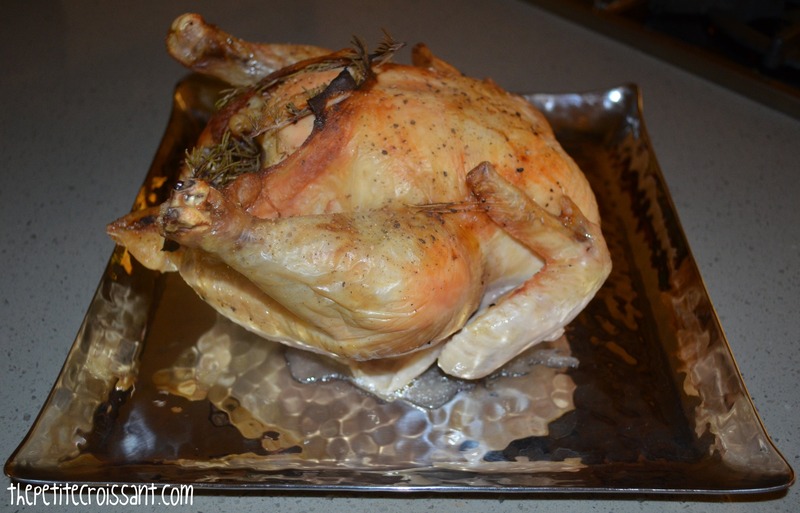 So simple, so easy, and yet so delicious. Dave opted for bacon instead of apple, which also made for a delicious sandwich.